Mr.S.K. Soni (Director) of Anmol Marbles and his Co-ordinator Mr. Rajiv Ji has involved in Marble Business For so many Years . 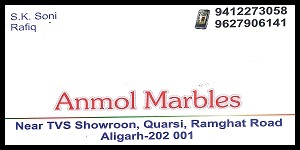 Anmol Marbles is one of the famous and well reputed position in Aligarh as well as all over UP. Anmol Marbles give to thier customer Brilliant Quality Marble with Many Choices with Reliability as well as Cheap And Best Quality. Anmol Marbles quality has a strong stone because its Minerals Grains have grown tightly together during a very slow cooling Period . Additionally , The Quartz and Feldspar that compose desirable for building and for ornamental purpose such as gravestones and Monuments .